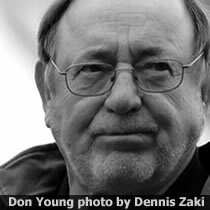 By Dennis Zaki - Alaska Republican Congressman Don Young spent $262,138 on lawyers last quarter anticipating multiple indictments from the FBI regarding his roles in at least three different criminal cases under investigation. Young's involvement in a $10 million earmark into a Florida highway bill that benefitted a big donor one week after he raised more than $41,000 in campaign contributions for Young is one target. A grand jury is working that case right now. Young's significant ties to imprisoned former lobbyist Jack Abramoff have drawn investigator's interest and Abramoff has reportedly given information to the FBI regarding payments to Young in the Indian lobbying scandal. Republican Bob Ney and two aides to Tom DeLay (R-TX) were indicted in that scandal. Young falsely claimed in February of 2006 "I have never had any personal or professional relationship with Abramoff." Documents have proved that he or his staff met or had discussions with Abramoff or his agents at least 11 times before February of 2006. A separate grand jury is working that case. A third grand jury has been investigating Young taking over $20,000 in campaign contributions from indicted Wisconsin executive Dennis Troha, his family members, and company executives just after Young inserted an item in the 2005 federal highways bill that helped JHT holdings owned by Troha. An amendment sponsored by Young allowed 97-foot multi-truck combinations on the highways; it was included in a highway spending bill that became law in August 2005, at the time Young chaired the House Transportation Committee. Campaign records show that Young received $25,000 from the Troha family and associates, with most of those dollars coming on May 23, 2005, the Journal Sentinel reported. "Don Young owes Alaskans an explanation," Alaska Democratic Party leader Jake Metcalfe said. "Why did he push a law that compromises highway safety? Why did he take campaign contributions from the trucking interests who benefited from that change?" Young lost his influential post as chairman of the House Transportation Committee when Democrats took control of Congress in January. Congressman Young's office did not return repeated e-mails from AlaskaReport.com seeking comment. Donald Edwin (Don) Young (born June 9, 1933) has been the sole congressman from Alaska in the United States House of Representatives since 1973. Young was a father of the infamous "Bridge to Nowhere," the Alaska bridge would have connected the town of Ketchikan (population 8,900) with its airport on the Island of Gravina (population 50) at a cost to federal taxpayers of $320 million. Relatives of Alaska's previous Republican governor owned land a mile from the bridge. Most famous quote: "Environmentalists are a self-centered bunch of waffle-stomping, Harvard-graduating, intellectual idiots" who "are not Americans, never have been Americans, never will be Americans."